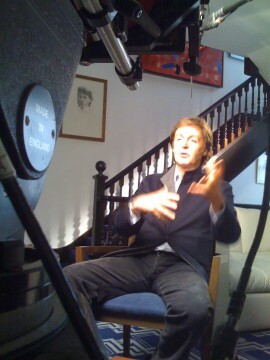 After the concert, we were able to schedule a follow up interview with Paul McCartney at his office in Soho, London. We were shooting in New York at the time so we left from NY on a Wednesday, interviewed him on Thursday and then flew back in time to keep shooting in NY on Friday. After I had setup all the lights with a stand-in (the director), Paul’s assistant arrived and told me that the lighting had to be a certain way. It didn’t exactly agree with the style that I had been going with for every other interview we had shot for this film. After he made his case, I needed to do some quick adjustments before Paul showed up. Paul showed up sooner than I thought and his assistant and I came up with a compromise that met Paul’s requirements as well as mine. We showed Paul on the monitor and he was happy with it. We weren’t allowed to take any pictures or get any autographs with him, but I did manage to sneak a shot from my camera phone during the interview. I’m bad. 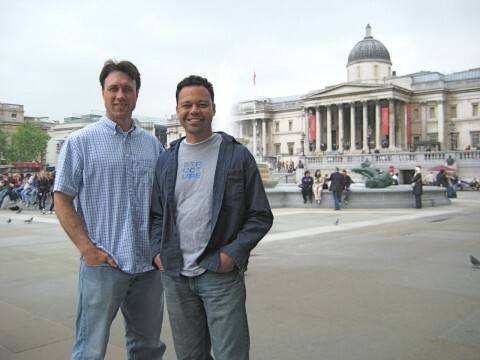 One cool, yet unrelated, thing that happened on this quick trip to London was that a long-time friend of mine, Clayton Vance, that I hadn’t seen in a while happened to be in London that day as well. He was studying abroad with fellow students from Notre Dame architectural school. We met up for lunch and he taught me a thing or two about classical architecture. I’ll never look at a lintle the same way again. He’s since graduated at the top of his class and working with a great firm. Congrats, Clayton! Clayton Vance and a chubbier version of me in London. Clayton was one of the missionaries that taught me about The Church of Jesus Christ of Latter-day Saints back in June of 1997. We’ve been friends ever since.